I may be new to Upwork but don't let that fool you. 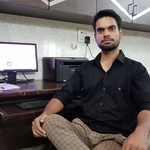 Hi,Dear My name is Nitish I'm a full time freelancer specialising in all types of MS Excel and MS Word tasks....Read moreI may be new to Upwork but don't let that fool you. My name is Nitish I'm a full time freelancer specialising in all types of MS Excel and MS Word tasks. Fast, reliable and cost effective service. I am dedicated, self motivated, extremely organized and detail oriented. I have a Bachelor Degree in Mechanical Engineering. I have years of experience in data entry, online researching, SolidWork ,AutoCAD drawing software. I respond to all messages in 12-24 hours. Thank you.